When I received this little photograph a couple of days ago it made me almost want to jump with joy. It’s a quilt, or the startings of one. At the centre is a lover’s knot embroidered onto a pale fabric. Not so extraordinary you might think. But for me, it is remarkable, because it is something that has until now only existed in my imagination. It is the quilt which forms the centrepiece of the plot of my new novel, The Forgotten Seamstress. I am not a quilter, apart from the small cot cover I made many years ago, so as I was embarking on this novel I was incredibly fortunate to be introduced to a true expert, teacher and fellow-author Lynne Edwards, MBE, who embraced the project with such enthusiasm I knew at once that our collaboration would produce something remarkable. With her years of experience and expertise, Lynne knew precisely what fabrics, techniques and other influences Maria would have had during the various stages of her life, and we had great fun creating her ‘virtual quilt’. 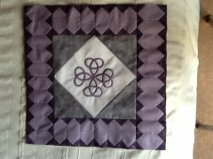 She also, very generously, wrote the pattern and instructions for making Maria’s Quilt, which are available for downloading here. And that is just what Judy Baker Rogers did. A highly experienced quilter and organiser of her own quilting group (the Cotton Scatterers of Wickham Bishops), Judy has taken on the challenge of making Maria’s Quilt – her interpretation of it, of course – and here are the first few ‘frames’ of the ‘medallion’ design. All those hours of imagining the quilt, of the woman who made it and the places that she sewed in and the trials she went through, those days of trying to find the words that would evoke a visual picture in the reader’s mind of this fictional creation, are emerging into life in front of my very eyes. I’ve always thought of Maria’s Quilt as a kind of character in my novel – just imagine if you could, by writing about someone, bring them to life. Jane Austen meets Mr Darcy, perhaps! Now can you see why I am so excited! And to Judy and Lynne, many many thanks. The Forgotten Seamstress arrived today. Can’t wait to get started reading. I loved the book, it totally captured my imagination and I simply could not put it down. When I read that my favourite author and teacher, Lynne Edwards, had designed a quilt pattern for the book I knew I had to make it. I have a little stash of beautiful silks left over from a special quilt I made some years ago so I am making it in silk. I have made several quilts designed by Lynne and I knew her instructions would be clear and easy to follow. I am now obsessed by the quilt just as I was by the book. Because I enjoyed the book so much I bought ‘The Last Telegram’ and enjoyed that too. This book made me even happier to be working with silk. I tried to send you some photos but the email address on the website appears to be obsolete. However, it doesn’t really matter at this stage as the quilt is not yet finished. It is not a quilt to be made in a hurry, tiny pieces which must be assembled accurately make for slower results but well worth it in the end. I heard about ‘The Forgotten Seamstress’ through an on line quilting group and news of it is spreading quickly.through the quilting world. Thank you so much for your lovely comments and I am thrilled that you are making the quilt. I’d love to see photos of your progress. My email address is liztrenow@hotmail.co.uk. With very best wishes, and I hope to meet you some time. The LOVED The Forgotten Seamstress too. Just finished the book. Will be reviewed on my blog on May 30. Thoroughly enjoyed your book and look forward to hearing you speak At The Quilter’s Guild region 8 regional day in April. Do come and say hello in April! This book has been a wonderful experience. Thank you both, Liz and Lynne. I shall enjoy making my version. As always Lynne has given generous, friendly instructions- she was undoubtedly the very best quilter for this task. ‘Thank you’ so very,very much. I am so glad you enjoyed the book. Do send a photo when you have made your own version. I agree re Lynne, I could not have found a better person to collaborate with me on the book.